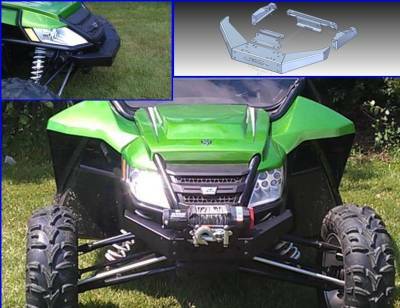 Arctic Cat Wildcat 1000 Front Bumper / Brush Guard with Winch Mount Fits: 2012-15 Wildcat 1000 WILL NOT FIT: Wildcat Trail (50" Model) Laser cut and CNC formed for a great fit. Powder coated for superior protection- Texture black. Two winch bolt patterns (6.6 wide x 3 deep and 4.875 wide x 3 deep). Accepts up to a 4000 lb winch. All welds ground smooth. Bolts to the frame. Can be used with or without a winch. Made in Cleveland, Ohio from American Steel. Add style and function to your Wildcat with this front brush guard and winch mount. Keeps your winch up high and out of the water. Laser cut and CNC formed to ensure a great fit every time.